Posted By:Unknown | At:12:51 PM Be the first to comment! 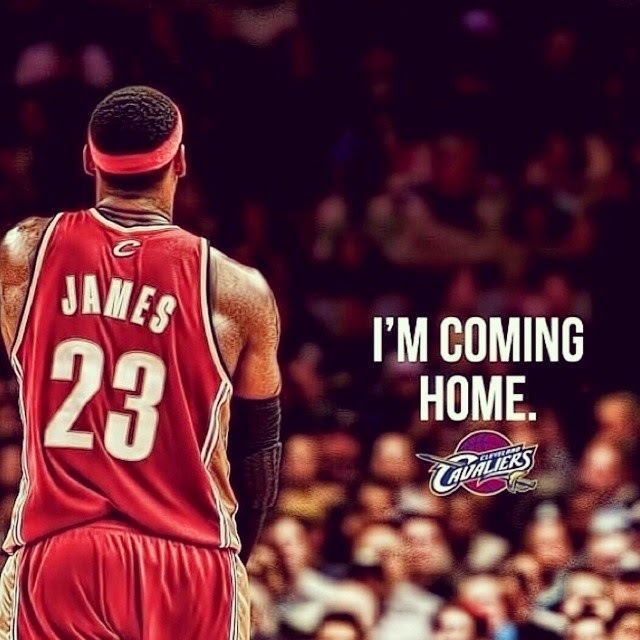 LeBron James is returning to ... Cleveland. In a dramatic move announced Friday via an interview with Sports Illustrated, the Cleveland Cavaliers won the sweepstakes for the biggest free agent on the market and best player in the world. A member of James' team confirmed the decision to USA TODAY Sports. What once seemed inconceivable is now a reality. LeBron James is a Cavalier again. LeBron James is a Cavalier again. "When I left Cleveland, I was on a mission," James told SI. "I was seeking championships, and we won two. But Miami already knew that feeling. Our city hasn't had that feeling in a long, long, long time. My goal is still to win as many titles as possible, no question. But what's most important for me is bringing one trophy back to Northeast Ohio." The Akron-born James is returning to Cleveland four years after leaving the team in soul-crushing fashion for the Miami Heat, which prompted Cavaliers fans and owner Dan Gilbert to turn viciously on the NBA superstar. It's an astonishing completion to the circle and a homecoming for the ages: The hometown hero turned reviled villain is again the celebrated hometown hero. The magnetic pull of returning to Cleveland, where James spent the first seven years of his NBA career, and trying to bring the city its first major championship since 1964 was too strong to resist. "To make the move I needed the support of my wife and my mom, who can be very tough," James told SI. "The letter from Dan Gilbert, the booing of the Cleveland fans, the jerseys being burned — seeing all that was hard for them. My emotions were more mixed. It was easy to say, 'OK, I don't want to deal with these people ever again.' But then you think about the other side. What if I were a kid who looked up to an athlete, and that athlete made me want to do better in my own life, and then he left? How would I react? I've met with Dan, face-to-face, man-to-man. We've talked it out. Everybody makes mistakes. I've made mistakes as well. Who am I to hold a grudge?" The 29-year-old went to Miami, won two titles and repaired his reputation. He joined friends and fellow All-Stars Dwyane Wade and Chris Bosh in forming a historic trio, but the Big 3 lasted only four years. He is a four-time MVP, two-time Finals MVP and Hall of Fame-bound superstar. Goodbye Miami, it was great while it lasted. Hello Cleveland, where there is unfinished business. James' agent, Rich Paul, talked with the Cavaliers, Houston Rockets, Los Angeles Lakers, Dallas Mavericks, Phoenix Suns, and James and Paul met Wednesday with Heat President Pat Riley in Las Vegas. It came down to Miami and Cleveland, and home won. His decision now opens the free agent flood gates. Expect teams to start making rapid-fire deals and players to find teams quickly after days of waiting. His decision also leaves the Heat in a quandary. Bosh could leave for the Houston Rockets, and although it's not exactly starting over, the Heat must remake the roster. Heat fans will be disappointed but likely won't react with the same anger as Cavs fans did when he left Cleveland four years ago. James deserves praise for deciding to go back. When he left, Cleveland fans burned his jersey and Gilbert wrote a bitter open letter that attacked James' character. When James returned to Cleveland for the first time as a member of the Heat, the hatred for James pulsated. Four years later, he put all that aside to do what he believed was the right. He joins a young Cavaliers team, featuring All-Star Kyrie Irving, the No. 1 pick in the 2011 NBA draft and four others selected among the top four picks from the past four drafts: swingman Andrew Wiggins (No. 1 in 2014), forward Anthony Bennett (No. 1 in 2013), guard Dion Waiters (No. 4 in 2012) and forward Tristan Thompson (No. 4 in 2011). It's obvious James sees more long-term potential with the Cavaliers than with the Heat. Miami wasn't athletic or talented enough to beat the San Antonio Spurs, and Miami's recent free-agent deals with forwards Josh McRoberts and Danny Granger weren't enough to convince James for another stint in Miami. On Wednesday, the Cavaliers made trades with the Boston Celtics and Brooklyn Nets and created enough cap space to give James a max salary contract, which he sought. With the Eastern Conference the weaker of the two conferences, James' addition makes the Cavs a contender to win the East. It might not make them favorites to win the title, but with time and development, the Cavs have all the ingredients to compete for a championship soon. Credit also goes to James' agent for facilitating this reunion. Paul also represents Thompson. Even though the James-Cavs breakup was ugly, Paul remained tight with Cavs executives, including Gilbert and general manager David Griffin. He kept the door open, just in case.